Yes, I know, I am a teensy bit behind. The truth is I have been postponing the lecture of this series. I know it : if it is not easy to start a book or a series it is even more difficult to end one on a high note. I admit it might be the end of White Trash Zombiness for me. Why? The novel was like that cover art pic – a complete mess even if pleasing to the eye (almost all Dos Santos covers are). There were some good scenes, like Angel dumping Marcus, her steady but a bit too controlling zombie boyfriend, or Angel deciding to attend college. Still after one third of the book I started to feel boredom creeping in my direction from the pages – not a good feeling when you are reading an allegedly breakneck-action UF romp . 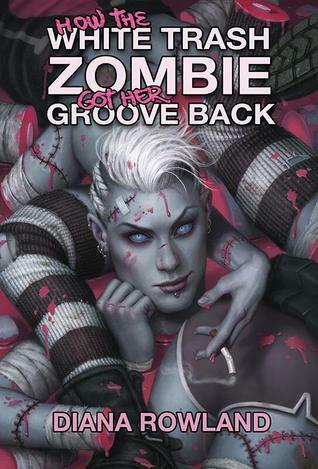 I couldn’t get over a suspicion that the author had no idea what to make of her heroine and how to prove she really got her groove back (whatever it means among the zombies). Rowland used every trick from the previous three parts and the effect was rather bland. First three books were original and more or less entertaining – as far as UF series go. Angel Crawford was a likeable heroine you could root for and her struggles to adapt to a new ‘lifestyle’ made me smile. In this one all those good vibes somehow disappeared among all the attacks, counterattacks, long car trips, shopping for food, shopping for firearms, shopping for posh clothes, evading bad guys, trying new drugs and so on. Add to that a bunch of completely interchangeable secondary characters who had nothing to say and acted with the grace and aplomb of a dummy and the result was me doing a lot of skimming. The simple setting of a small-town in Louisiana was traded for New York City, which I believe to be a big detriment to the books. I suppose it was to illustrate how our heroine went places and saw the wide world but the change of the scenery didn’t make the novel more exciting, quite the opposite. So far my least favourite White Trash Zombie part. A major meh and I am not sure whether or not to continue the series. This entry was posted in book review, chicklit, contemporary, crime, fantasy, meh, rating, urban fantasy and tagged bland characters, Diana Rowland, how the white trash zombie got her groove back, meh, series alert, white trash zombie, zombies. Bookmark the permalink. It was a lot of shopping. Bad luck – I hate shopping, in real life and in fiction too. Meh – not the series for me. And not for me – unfortunately.